Mt. Kilimanjaro Weather - When is the Best Time to Climb? The Mount Kilimanjaro weather affects your climb and your success chances. When to climb Kilimanjaro is an important decision. Bad weather on Kilimanjaro not only makes for a miserable trek and ruins your photos, most importantly it simply makes the climb twice as hard! You are a LOT more likely to reach the summit if the weather on Kilimanjaro is good. Mount Kilimanjaro is near the equator. In the tropics there is no such thing as summer and winter. There are only dry and rainy periods. Or "dry seasons" and "wet seasons". 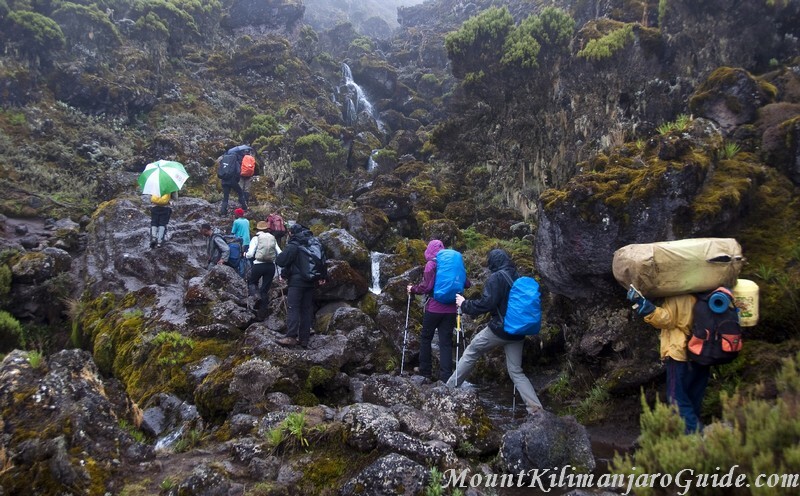 A second rainy day on the Machame Route. Not the best weather for Kilimanjaro. © Uta Philipp. So lets look at the Kilimanjaro weather details over the year. The Weather on Kilimanjaro - When to Go? The main rainy season lasts from the end of March through to mid June. As elsewhere in the world, when exactly it rains and when it stops is impossible to predict. It's the warmest time of the year in Tanzania, but those months are so wet that many operators simply do not offer climbs in April/May at all. The four to six weeks around Christmas and New Year are the second peak climbing season on Kilimanjaro. Traffic is extremely high despite there still being a good chance of rainfall and thick clouds in the lower regions. It's not a time I would choose. Mid January to mid March is also a good time to climb Kilimanjaro. The weather is reasonable, not too cold, not too wet, and there aren't as many climbers. The days are mainly dry, beautifully clear with few clouds and occasional brief showers. In March the chances of rain gradually increase as you approach the long rainy season. See above. There are a few more things worth mentiong about the weather on Kilimanjaro. You may decide to climb at a less than perfect time, be it because you want to avoid the main rush or because that is the only opportunity you have to take the time off from work. If that's the case, consider the Rongai Route. The northern side of the mountain is much drier than the otherKilimanjaro routes. One question that nearly everybody asks: just how cold is it on the summit? Or rather, during that night climb? The temperatures during summit night can drop to -20°C (-5F), but be aware that with the additional chill factor of wind the felt temperature may be as low as -40 (curiously, both in degrees Celsius and Fahrenheit). Prepare for the worst case scenario, and then enjoy that everything turns out much easier than expected!